There is one thing I am really bad at. I know it is pretty much the number one rule for living a healthy life, but I am terrible at drinking water. Actually, to be honest, I rarely drink it at all. I know this is bad for me. I realised this when I donated blood earlier this year and fainted. Now this probably wouldn’t have been a problem had I not been standing outside the theatre with friends, and subsequently fainted on the sidewalk, hitting my head, rather hardly, on the concrete. And I know this should have made me drink more water but I haven’t been. I mostly notice it when I exercise; sometimes afterwards I feel a little lightheaded. Sometimes in summer when I stand up from a sitting position, I get dizzy, and apparently that's from not drinking enough water. So what do you guys do? Any sneaky ways you get more water into your body? It's not like I drink juice or softdrink or anything else - if I'm eating I'll have water, and I feel thirsty I will drink it. Otherwise, I just can't do it. I feel too sick. But onto much happier topics - here is a lovely recipe for pasta cabonara - low fat and beautiful. Trust me, scrimping on the cream does not mean scrimping on taste. 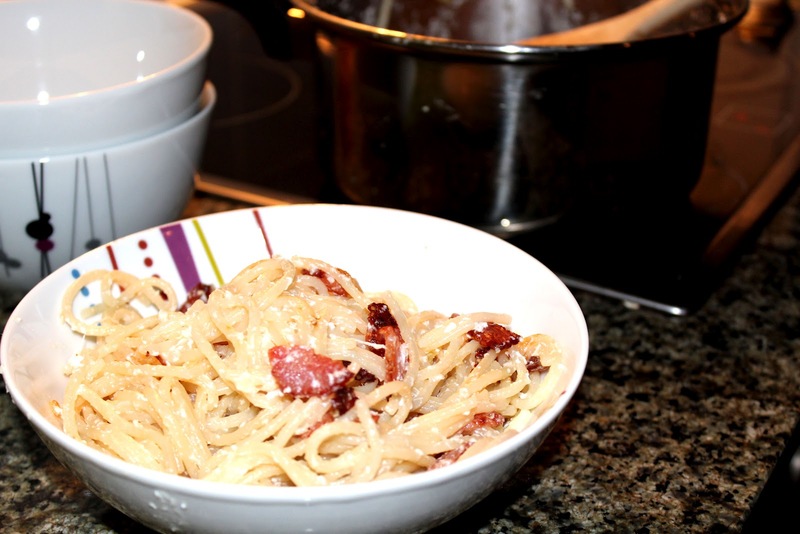 The pasta is still thickly coated, the bacon still lovingly crisp and the onion adds subtle hints of flavour to the amazing dish. It is very easy, very simple, and best of all, very healthy. This is my go-to recipe when I get home unexpectedly late and want something a little more substantial than cereal, or if I know I will binge on cereal and other unhealthy treats, I will cook this to fill me up. 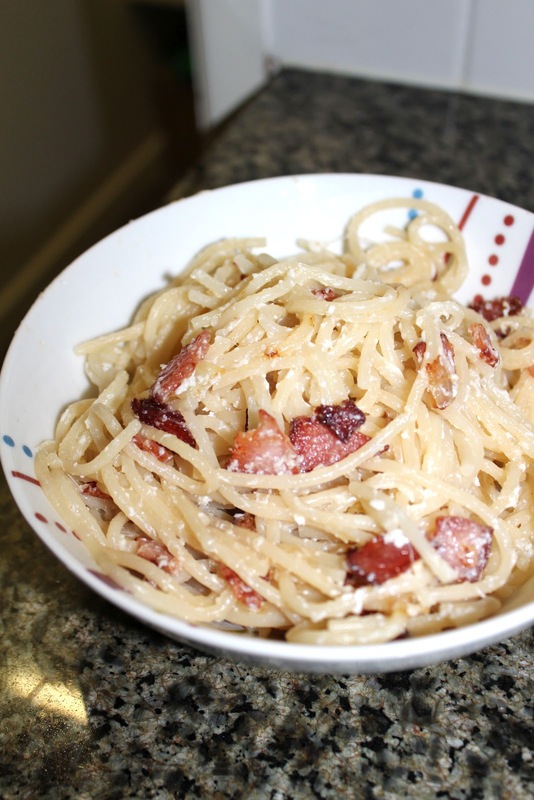 It is very easy; I often throw the pasta in the saucepan, take a quick shower, chop up the bacon and onion, fry it quickly, and the dish is pretty much done. Just make sure to add the egg whites to the pasta when the pasta is hot - otherwise the egg whites will not stick to the pasta and while it will still taste fine, the pasta will not have that creamy texture of cabonara. Menu Options: Of course feel free to add any other pasta basics to this menu – prosciutto, mushrooms, olives, whatever you like. This is just a very basic recipe which is low in fat. 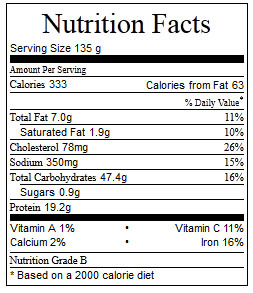 Adding other ingredients will change the nutritional values. Serves 4 – though to be honest it could easily serve 6 people. 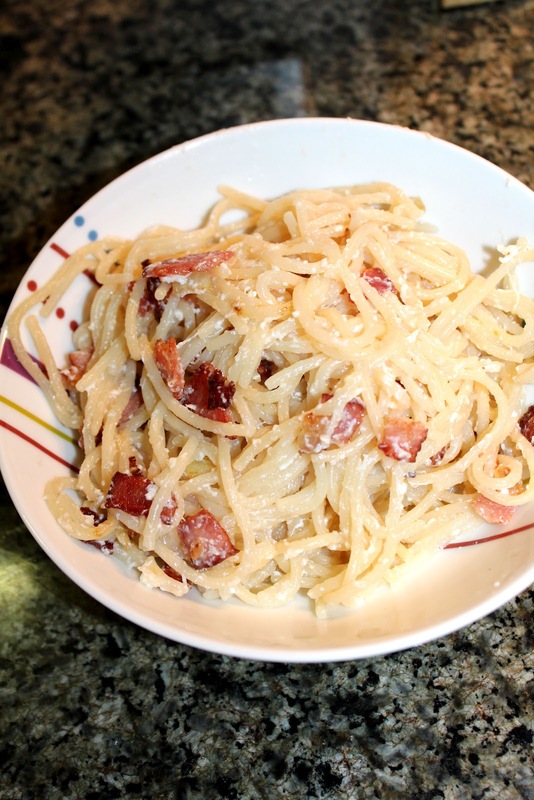 Just make the amount of pasta you usually make for your family, adapt the bacon amount freely and if only serving two people, use 2 egg whites. - 500 g pasta – dried fettucine or penne is what I usually use, but you can use any. I actually haven’t tried this with wholewheat pasta yet, as I only bought my first wholewheat pasta the other day. However I’m sure the recipe is adaptable for those who don’t eat white flour. - 100g rindless shortcut bacon. I buy Weight Watchers brand, so I know my bacon is high quality, but you can just buy regular, fatty bacon if you wish. Cook the pasta in a large saucepan of salted, boiling water. Cook according to packet directions or until the pasta is tender. I like my pasta really soft, so it takes me around 20 – 30 minutes depending on how high the heat is. While the pasta is cooking, spray a skillet with olive or vegetable oil. Dice the bacon and onion into small pieces. Add to the skillet and cook until both ingredients are golden. Whisk the three egg whites together. You must do the following step when the pasta is hot. Quickly take the cooked pasta from the stove and drain it, placing the pasta back into the saucepan. Coat the pasta with the egg whites while the pasta is hot, as soon as you can. Stir the egg whites into the pasta with a wooden spoon. The pasta will be slightly covered in the egg whites, and admittedly won’t look fantastic. Make sure all the pasta is covered. Add the cooked onion and bacon and stir well. Divide into four bowls, topping each dish with parmesan and parsley. If you prefer other herbs with your pasta, such as basil, add that. Serve while hot. Wow this looks seriously good! I've never heard of the technique of stirring egg whites into pasta before though - that's really neat! As for drinking water, I'm pretty bad at it too! So I just drink a lot of tea - it motivates me to drink more. Mmm, this looks good! I've never had pasta carbonara before, I thought it had bacon! I guess not! I so feel you on the water thing. I absolutely DESPISE the taste of water. Normally I drink seltzer or cover up the taste of water with those little mio things. They're really good! I am seriously the SAME way... sooo bad at drinking water! I don't know why, I mean it's not that I don't like it, but I just choose soda, vitamin water zero, coffee and tea over just plain water. I know I am still being hydrated (well not with soda) but I don't like that I have made a habit of NOT having it. Need to work on this! Wow, I was surprised at how easy the method was and how few ingredients are needed. I highly recommend getting Nobles 'Pureau, Pure Water' cask water. it's Australian made, and tastes far better than tap water, and because it's pure it assimilates in to your system better due to not having to deal with impurities such as fluoride and chlorine!